"While we may be praying to God, God is praying for you"
105 - All religions have a call to prayer, sometimes strange - Sidney Harris, "How God must laugh at the catatonic poses people put themselves into when a public prayer invocation is incited." 106 - The metaphysics perspective on prayer is different in that there is no "absence of God," rather God is present, acting as us. God is present as an allness of which you and I are an eachness. Prayer is conditioning our life with the activity of God. 107 - Where then does God come in? God doesn't come in because God never went out. We need to get into the consciousness of oneness with God. We live in Divine Mind, this is our milieu. Live can only be understood when we understand that we are in fluctuating states of consciousness. 108 - For most people prayer is something we learn. Prayer as the science of being not doing. 109 - Prayer is the consciousness of the allness of life. Allness is perhaps a better term than God because it is less misunderstood. We live and move in the allness of life. 110 - In the most simple terms, while we may be praying to God, God is is praying for you. The Allness is ever expressing itself in its eachness. Rather than pray, be still and know God's oneness. 111 - Then why would Jesus say to "ask and you shall receive"? Matthew 21:22. Because "Ye ask, and receive not, because ye ask amiss" James 4:3 To "ask" means to "claim" or "demand." "Thus saith Jehovah, the Holy One of Israel, and his Maker: Ask me of the things that are to come; concerning my sons, and concerning the work of my hands, command ye me." Isaiah 45:11 So "claim and you shall receive." You ask for light by getting out into the sun; you ask for life by claiming it. 112 - The creative way to ask for help is to create the condition that makes the result inevitable. This is how to ask for help. 113 - We spend so much of our life in a life negating consciousness. Prayer is a systematic, scientific way of changing your thoughts and getting yourself in tune with the divine flow. There is no way God can answer your prayer without something happening to change your consciousness. As long as you have a negative consciousness then the switch is off. 114 - The responsibility is on you to change your consciousness, but so is the privilege. True, scientific prayer is getting to a yes consciousness. But sometimes we focus too much on the problem rather than the solution. Let go of the problem and let God. 115 - Prayer as an affirmation of the truth, not a supplication. But affirming the truth does not make it true. Either it is real or it isn't. We speak the truth to create the condition in consciousness to make the result inevitable. 116 - The first step in metaphysical treatment is the Silence, not affirmations. "Be still and know that I am" (Psalms 46:10) and in that stillness, listen. Every problem is life trying to communicate something to us; so we need to begin with "be still and listen" and then "say what one is listening to." 117 - "The Silence" is the same as meditation, but it is without technique. True meditation is giving up the desire to reach. The Silence is spiritual, meditation can be only therapeutic. 118 - Any attempt to "reach the presence" is "practicing the absence of God." Meditation, or the Silence, is concentration at the center, prayer is the concentration of thought from the center. Meditation/Silence is centering oneness as God expressing as you and prayer is a projection of that knowing as affirmation. Meditation is just sitting quiet, but prayer is a projection of that consciousness. Prayer must always begin with the "inner centering" of meditation. This is the missing link in prayer treatment. 119 - Practical advice about what to do in prayer. Prayer is not doing (something), but "not doing." We must always begin by creating the condition that makes the result inevitable. 120 - Never pray until you have taken this time of oneness. When we are still enough, the "heavenly heart reveals itself." 121 Homework assignment part one is the centering process of The Silence or meditation. Take time to practice the idea of getting centered. 122 - Homework assignment part two is to involve yourself in a prayer treatment seeing the situation correctly, quietyly using and affirmation, allowing a healing flow. 123 - Meditation - feel gratitude. The call to prayer is heard in many languages, and certainly through many religions. It may be an involvement with the throwing of a sticks by a Confucianist. It may be the prayer wheel of an easterner. It may be the voice from the tower calling the Islamite to pray as he prostates himself toward the east. It may be the saying of a Mass, it may be an American Indian standing on a hillside with his arms outstretched toward the moon as he prays in a consciousness of celebrating the whole universe. It may be a student of truth expressing an affirmation. Actually, the phrase "Pray about it," is so perfunctorily used that it often becomes little more than a cliché. It implies, quite often, engaging in a ritual or a public ceremony that is experienced through a position of the body or intonation of the voice or verbally by route. I love the comment of Sidney Harris, the syndicated news columnist. He whimsically says, "How God must laugh at the catatonic poses people put themselves into when a public prayer or invocation is recited, as if he were a general out there reviewing the troops." Prayer often also implies a last-ditch effort, which is reminiscent of Shakespeare's tempest where the words are expressed, "All lost, all lost, to prayers, to prayers." There is help, so now we might as well ask God for help. It would remind us of the old group drama where in a crises, the dramatist might swing at God from the wings to disentangle a desperate situation. 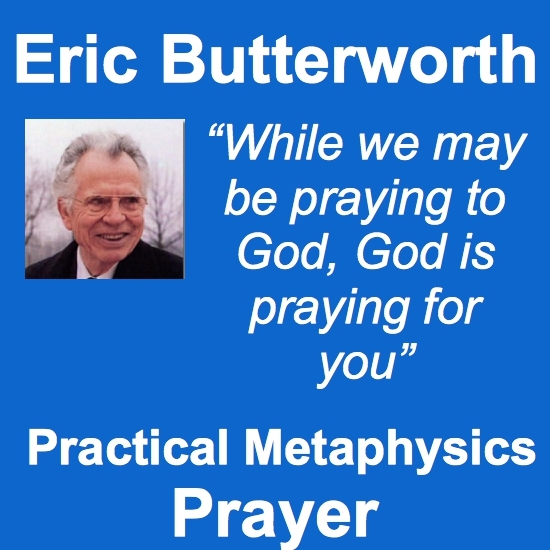 As we have outlined in recent weeks, metaphysics is a way of thinking, and as I want to clearly point out today, it is also a way of praying. But I think we need to understand what is implied by this word, "prayer." We might consult a dictionary, but it really wouldn't be too much help. The dictionary says, or indicates, how the word has been submerged in stereotypes as it defines prayer as, "to entreat, to implore, to supplicate, as to God." In other words used, "Intercession, exhortation, invocation, benediction," and on and on we could go. But obviously this tends to imply an attempt to deal with God out there somewhere, God who is separate, God who is apart. God who is the big person of the sky, like the giant creature of Michelangelo's artwork on the ceiling of the Sistine Chapel in Rome. But you see, this is the problem. While we can understand the relationship, which will imply a metaphysical system, it's important to let go of this absence of God image. As Emerson says, "God may fire us with his presence." We can get away from the thought of God somewhere, and think of God as present, active within us, expressing himself as us. We must let go of the tendency to pray to God, to reach for God, to supplicate help from God, and to get to the realization that God is present as the allness in which I exist and you exist, as an eachness. These are not just words, this is a realization that we must work to realize. It's important to let go of the "Say your prayers" technique. Prayer is not conditioning God with your needs, begging for handouts from heaven. Rather, prayer is conditioning your life with the activity of God. Start causing some change in God or the attitude of God, but it's causing a change in your tendency, your consciousness, your awareness, so that you can acknowledge that which is. Jesus clearly says, "The father knows what things you have need of even before you ask." So there's no need to tell God about your problems. There's no need to beg and plead and supplicate help. I often say, jokingly, that there's no point in asking God to do something for you because God has already done everything that he can ever do, period, final. We are without end. When he created you in the beginning in his image likeness. Now you may say, as people often do say, "Where does God come in, then?" Well, God doesn't come in. Because God never went out. That's important, you see. God is spirit, present in its entirety at every point in space at the same time. God is the answer, and God is present so the answer is present. Whatever it is that you're seeking to understand, whatever guidance you need, whatever thing that you feel needs to be expressed or experienced in your life, it is present, total, complete, or it doesn't exist at all. There is no point in asking for something that is outside of your present awareness, your present relationship in the divine flow. The point is, we need to get into the consciousness of oneness with God. It's not a matter of trying to get God into us, but of you and I getting into the awareness of that which is present. So consciousness, you see, is the key. We live in divine mind. We talk about this often. We articulated something on this a number of weeks ago. We live in divine mind. This is our milieu. It is impossible to have a mind apart from divine mind. You don't have a mind that is separate and apart from the infinite. Your mind is an activity within divine mind, a state of consciousness of divine mind. Life can only be understood when we know that we are always in fluctuating states of consciousness. So the key to healing and overcoming is changing consciousness. This is what prayer is all about. It's not changing God, it's not begging him to change his mind toward us, but it's changing our consciousness. Prayer is not something you learn to do, like learning to drive a car or learning to type or learning to work shorthand or even work crossword puzzles. A little girl was once asked, when company was present, to come out and say her prayers for the company because her parents were delighted with the way she could say her "Now I lay me down to sleep." So the little girl came out, all agog with the anticipation of performing before the guests. So she stood there and closed her eyes and said her little prayer. They were all very flattered and they praised her and they loved her and blessed her and the little girl finally blurted out, "But you ought to hear me gargle." In other words, this prayer technique was something she had learned to do, some words she had learned to memorize, a pose that she had learned to take on. We laugh at this, and yet to a large extent this is the way prayer is involved in by so many praying people. It's something we learn. We go to catechism school, we learn to get involved in the experience by learning the words and taking on the pose, or as person going to a traditional church, learning when to stand and when to sit and when to kneel and when to say the "Our fathers" and so forth. You see, prayer is not simply a scientific way to do something, it is the very science of being. This is an important distinction. Otherwise the emphasis is placed purely on performing the ritual, speaking the words, saying the mass, going through the outward experience of that which we've learned to do. The key to understanding prayer is allness. I use this term often, but it's so important. I use it interchangeably with he word God, but you see the reason I use it as a substitute for God is because so often when we use the word God, we think out, we think up, we think something separate. As long as we think something separate we've created a separation which exists within us, and prayer can only be effective when we think oneness. So instead of thinking of God, I think allness. Allness means totality. It's not out there somewhere, it's the whole thing. In other words you might use the word universe, the whole of things. All life is present. You see, if there's allness, the whole is present, all life is present, all wisdom is present, all substance is present, all guidance is present, all love is present. We live and move and have our being in this allness which is present, not absent. So prayer is not trying to get more life, to get more love, even from God. But rather to know our oneness. As Gary sang in the song, "Be still and know that I am God." Trying to get more is to be still and know that I am, that I am the activity of life, all life, expressing at the point where I am. I need to know that. The fact is we don't know it, and because we don't know it, we lose the consciousness of it, and because life is consciousness, when we're out of the awareness of the allness of life, then we experience separation and deterioration. So the need is not for God to give us more life, but to be more aware of the allness of life which is present in which I live and move and have my being. I can never get out of it. The wonderful part of the creative process is that the allness is ever seeking to fulfill itself in the eachness. This is a play on words, but it's important that we see this. I am an eachness within the allness of God. Jesus would say, "It is the father's good pleasure to give you the kingdom," and the kingdom, he says, is not here nor there, but it's within you. The kingdom is the whole that is present even in the part. In other words the kingdom is the oak tree that is present even in the seed. It's the Christ that is present even in the imperfect person. It's the allness of God that is present even in the individual at the point where he is. What this says is, in its simplest possible terms, is while you may be involved in praying to God, the ultimate reality is, God is praying for you. Understand that? The father's good pleasure to give you the kingdom. The allness has but one intent as far as you're concerned, that is to perfect itself and to express itself in and as you. Life is seeking to fulfill itself in you, in the renewing process of your body. Love is constantly renewing itself in you. The Bible says, "For I have loved thee with an everlasting love" (Jer. 31:3). Guidance is a principle that is ever present, always seeking to direct you and guide you at the point of your experience, in every turning of life's way. So the allness is ever seeking to express itself in the eachness. So that God is praying for you. So the reason this is why I say so often, "Don't pray to God, but pray from the consciousness of God." First of all, be still and know that I am. You don't have to reach God, you have to reach yourself. You have to wake up. Stop thinking in terms of separation and absence and saying prayers and doing all sorts of magic things is going to cause something out here to come into me. Be still and know my oneness. Be still and know that I am, that God is present, not absent. And in the knowing that, then I become relaxed and receptive and I allow that infinite process to simply do its perfect work, and its perfect work is to express itself totally and completely in me. It has no other intent as far as I'm concerned, except to hear me, to guide me, to direct me. I don't have to beg and plead and supplicate. As long as I am begging and pleading and supplicating, I am creating a separation. I create the barrier, and then I try to surpass it. Be still and know that I am. Why would Jesus, then, indicate that we should ask God for help if we want his answers? "All things you pray and desire and ask for, you shall receive," (Mark 11:24) he said. This little word, "Ask," has created a lot of confusion. Quite often people say, "I ask God for this or that and God just says no." The implication is that God doesn't like me, or that God's too busy about other things, or perhaps that he wants me to suffer for some inscrutable reason of his own, and of course a lot of religious tradition has rationalized man's problems in this way. But Jesus says, "You ask and you receive not because you ask amiss" (James 4:3). In other words, you ask in a begging attitude, you're pleading and supplicating for something, something which is already the reality of your being. You see, interestingly enough, if you look up the word, "Ask," in both the Hebrew and the Latin or the Greek root words as they are translated from the scriptures, you find that the strongest connotation is to claim or demand. Not to beg, but to claim. You ask for electricity when you walk into a room by claiming it, by turning on the switch. The power is already there, but you claim it. The Old Testament says, "Concerning the work of my hands, command ye me." Now this is a vital realization of truth, you see. You ask for light by getting out into the sun, or by raising the shades. You ask for air by lifting up the window. You ask for health and for life by accepting it, by claiming it, by demanding it. You don't have to beg God to hear you because God, as far as you're concerned, is the healing principle that is ever present and has nothing whatever to do except to be perfect life and health within you. So the fact is, the sickness is not the result of something that God has done to separate himself from you, but like the prodigal son, we have gone out into the far country and have separated ourselves from life. So the need is not to get God to heal us, but to accept that healing life which God is, and which is present and can never be absent, except that we think it is absent. The problem is in our own consciousness. So this little word, "Ask" is a great problem. A creative way of asking for help is to create the condition that makes the result inevitable. You create the condition that makes the result inevitable. You ask for electricity by throwing the switch, and what do you do? You throw the switch, you make a contact, and when you make the contact, the result of a flow of electrical energy into the circuit and into the filament of the light, which thus gets warm and heats up and becomes white and becomes the light of the room, by making it inevitable. You make it inevitable simply by making the contact. So it is in all things. You create the conditions that make the result inevitable. You create the condition in consciousness which makes healing inevitable when you synchronize your thought and lift yourself to the high level of consciousness to where you believe that you are a spiritual being one with divine life. You accept God's healing life, not begging, not supplicating, but you accept it. You claim it, you demand it. Synchronized in consciousness, the result of the healing flow is inevitable. It's not something that God does specially for you because he likes you or dislikes you or because you touched the right button, but because you have allowed to be that which is, but you've allowed it to be for you, because you get into the being consciousness. Problems in our experience come because of a negative or a no awareness. We ask for divine help by getting to a positive or yes kind of consciousness. That's why we say all the time, "You can change your life by altering your thoughts. When you alter your thoughts, you don't change God's will toward you, because God's will toward you is fixed and final, it can never be anything else, except the infinite desire to perfect himself in that which he has created, to be health, to be guidance, to be life, to be love, to be substance in you and for you and through you. But you change your thoughts, and thus you get into a yes consciousness, you become synchronized with the divine flow, and you create the condition that makes the result inevitable. It's important we understand this, otherwise we think of positive thinking as a little exercise in hypnosis or autosuggestion and so forth. It's not this at all. True positive thinking is simply synchronizing yourself with the great positive, with the great yes of spirit, and thus you create the condition that makes the result of health and healing and guidance inevitable. So consciousness is the key. You see the fact is that we spend so much of our time, of our waking moments, in an life-negating consciousness. We've talked about this in recent weeks, but it's startling. If you could just become aware of how negative we are so much of the time. We say, "Oh but I have to be realistic." Or often people say, "Well let's be realistic." What they mean is, "Let's be negative for awhile." They think about how terrible things are, you know. All right if you want to, but the important thing is, we spend so much of our time in a life-negating consciousness, and the great need is to turn to a life-affirming consciousness. "Be ye transformed by the renewing of your mind" (Rom. 12:2). This is what prayer is. It's not dealing with some special appeal to the heavens, but it's a systematic, scientific way of changing your thoughts and getting yourself in tune with the divine flow. The important thing to understand is that there is no way, emphasize, there is no way, that God can answer your prayer without something happening to change your consciousness. If we want to carry that to the extreme, we can also say there is no way that God can change your consciousness. No way. God is the ceaseless longing to express total and completely in you, but as long as you have a negative consciousness, then you have the off switch off. You're separated, you're frustrating it, you're allowing it absolutely no way to flow through you. God can only do for you what he can do through you. That's a cliché that I use so often, but it's important. God can only do for you what he can do through you. There is no way that God can answer your prayers except by the change of your consciousness, and God cannot change your consciousness, only you can. That puts the burden right back on our shoulders. See, so often we tend to deal with God much as people deal with a doctor. People, they overeat and overindulge and do all sorts of terrible things, and then they go to the doctor and expect the doctor to heal them. Quite often the doctor may be very gracious and may be thinking more in terms of his practice and he may not say, "Look, you better stop indulging yourself or else there's nothing I can do to help you." But he quite often will give you the pills and pat you on the hand and say, "Well you'll be all right, just do this three times a day." But the fact is there's no way that a doctor can help you. If you're doing something wrong, you have got to stop doing it. There's no way that God can help you as long as you're in a negative state of consciousness. Until you change that consciousness, and only you can do it. And you might as well face it, it puts the burden right on us. That's why I know an awful lot of people say, "Well you're really hard on us." Well maybe you'd like me to just give you a lot of soothing potions and tell you, "Everything will be all right dear. It's fine, just go out and know that the world is out of divine order, people are great, and you're great and wonderful, just keep doing as you are, only just accept it that it's a wonderful life." Well, perhaps some of us would like that. Maybe we would become, as we could say, suckers for that kind of any approach. But I want to be very blunt and very frank. There is no way that you can change your life without you being involved in the changing process. You have to do it. If you want to stop taking on the kind of calories that make for obesity, then you're going to have to discipline yourself to cut down on the calories. Nothing can do it for you, you can't find any magic diet, you can't find any great nutritionist, not even God is going to help unless you exercise the will to push yourself away from the table. So it is in prayer. It comes right back on your consciousness, your thoughts, and you have to discipline yourself, but you can. The marvelous part is the responsibility is on you, but the privilege is in you. Because you have the allness of the infinite process of God ever with you and it is his good pleasure to give you the kingdom. It's all present, all you have to do is throw the switch. It's not easy, because most of us have so encrusted that switch with all sorts of negativity that we can't even find the switch, let alone throw it. But all we have to do is say yes. Yes. That's what true scientific prayer is. It's getting into the yes consciousness. God always says yes. We have to say yes to God's yes. What often happens, in the study of metaphysics, we get involved in affirmations and treatments, and this of course is a scientific way to get into the flow of a spiritual awareness, and it's very helpful, but you see sometimes we spend so much time trying to treat a problem that we get the problem at the center of our consciousness. It's like the person says, "I have no tension, I have no strain, I have no resistance in me at all." He says this over and over and over again, so what he's really saying is tension and strain and resistance are my problems. Emmet Fox would say, "Don't think about the problem, think about God." Basically the need in prayer is to let go. It's not easy, but at least let's understand that's what the need is. We so often say, "Take the problem to God." Well, there's nowhere to give it to. You see if we think of giving it to God, quite often we think of glamorizing the fact that I have a problem and therefore God's going to feel sorry for me. Don't take your problem to God, let it go. Release it. Let go, and let God, and know that God knows, and that God is always saying yes, and you say yes to God. Get into a yes consciousness, and you create the condition that makes the result inevitable. This is why a prayer should be an affirmation and not a supplication. But you see, it's important we understand that affirming the truth does not make it true. I've heard some teachers say, "If you say this affirmation over 100 times, it will become real for you." My thought about that is, and it's not facetious at all, that if it's not real before you say it 100 times then you might as well forget the whole matter. Either it's real or it isn't. You can't make it real. You can't make it true. Speaking a word of truth doesn't change the truth whatever. You're not speaking the word to make the truth true. Be very sure that when you use an affirmation or the affirmative realization or the treatment process that you're not saying these things to make something happen. What you're really doing is creating the conditions in your consciousness, getting yourself on the yes level, lifting your awareness to the divine level while synchronizing yourself to the divine activity, creating the condition that makes the result inevitable. But you're not moving God by your prayers, you see, otherwise you're like the little girl, I mean, I've said my prayer and I've said, "God is life, God is life, God is life, hey, I'm doing a good job at that. You ought to hear my gargle." You don't get points for how well you say your affirmations. You may know the most affirmations and treatments in the world. You may have so many that you feel that this is really the result of your years of study. I've often facetiously commented on the fact that many true students exchange affirmations like little kids exchange baseball cards. "Here, I'll give you three Ralph Kiners for one Babe Ruth." "I'll give you this affirmation for arthritis if you'll give me one for heart trouble." We tend to think that the word itself is some magic formula. "Oh, I got a great affirmation. I got a great treatment. Oh this is marvelous." I don't want to disabuse you of something that may be very dear to you, but let's shock you anyway. There's no power whatever in the affirmation. The power is that which can flow through the light switch if the light switch creates the condition that makes the result inevitable. The affirmation or the treatment is not the power, but it can, if properly use, lift your consciousness to awareness where the power may flow through, but when it does, and as Jesus said, "The words I say are not my words, but the words of him who sent me." So you see, true prayer is not just a set of metaphysical truisms. It is not just substituting words of truth for the ritual out of the prayer book. The power is not in the words at all, but in the life-affirming attitude, and that life-affirming attitude is so important, so real, so true, that if you get that consciousness, then you really don't even need the words. True prayer is not in words at all. The words may help us to get into a consciousness of prayer, but you can pray without any words, absolutely. Words simply say yes, or should do so, to the transcendence of life. But Jesus warns, "Use not vain repetitions, but enter into the inner chamber and close the door." Certainly a lot of traditional religions need to know that, but a lot of people in metaphysical studies need to know it. When was the last time you used a prayer affirmation over and over and over again because you read somewhere that's what you should do? Jesus says, "Use not vain repetitions." You're not going to be heard for how many times you speak the prayer. Say it three times, say it 10 times, say it 20 times, say it 100 times, and something is going to happen. Use not vain repetitions, but enter into the inner chamber and close the door (Matt. 6:6). In other words, enter that inner consciousness of wordless silence. In ancient Chinese, there is a saying, "If a man be absolutely quiet, then the heavenly heart will manifest itself." If one be completely quiet. That's not easy. It's not easy for us to get into a sense of quiet. Silence is difficult for most of us. You see in this quiet or silence, there is no pressure to achieve anything. There is nowhere to go. It's not running from self to find some transcendent vision of reality. It is letting go of the masks of human consciousness to know thyself at the point of God expressing as you. You see, this first step of the silence is what I often call the missing link in much of what is called metaphysical treatment, or the affirmation process in truth. There is a tendency to start frantically voicing affirmations with emphasis upon their repetition, upon the tone of voice, and on the fervency of emotion. But all of this is, "You ought to hear me gargle." I mean, it's all something we learned to do. Quite often missing is the first step, "Be still and know that I am" (Psalms 46:10). In that knowingness, in that stillness, listen. You see, you're a whole creature, so that in all experiences, something within you is seeking, even if sometimes unsuccessfully, to communicate itself to you. Even a headache, is trying to say something to you if you'll listen. It's your body saying, "I need attention, I need help." Quite often we don't listen, we pop an aspirin in our mouth. We pay no attention, really, to what it's saying at all. Every problem, relationship problems, financial difficulties, physical problems, is life trying to communicate something to you, that if you would listen, so that fundamentally in prayer, if all we start mouthing affirmations, or repeating these hypnotic suggestions to ourselves, "Be still and know that I am." Be still, be still, be still, be still, and listen. Then, say what you're listening to. You see, I feel that a person never really is getting the full message of truth, or going beyond the naïve approach in metaphysics, until he begins to let go of the tendency to use stereotyped affirmations and treatments. You know, it's fine, you can read a marvelous treatment in a magazine or statement out of the daily word, and say, "This is great, I can use this today." And then you run with that. It's like a child using training wheels on his bicycle. They help him to ride for awhile. But we would think it very foolish if a child would spend the rest of his life riding a bicycle with training wheels. You see someone riding around Central Park on Sunday afternoon with training wheels on his bicycle, you'd say, "Hey, he never grew up." Because you know that riding a bicycle requires a certain amount of balance and it certainly requires a discipline and a training, and eventually you develop a skill at it. So the point is, an affirmation is a training process but ultimately we need to evolve the tendency to use the affirmations that come out of our own self, spontaneously, and don't say, "I can't do that because I'm not very articulate," because that's to put yourself down, and we need to lift ourselves up rather than to put ourselves down. So listen. Really listen. And then say what you're listening to, and if what you're listening to is silence, then give an articulation of silence. Sometimes it's better not to speak a word than to speak a word perfunctorily, or automatically, or hypnotically. But listen, and then say what you're listening to. Not simply listening to what you're saying. As long as you're listening to what you're saying, you may be speaking some word, and kind of on the ego fulfillment say, "Hey, I'm doing pretty good. I've got this great affirmation, I can say it and mighty articulately. So you get a point for being able to say it articulately, but you're not really fulfilling the principle. The principle is to listen, be still and listen. In that point of silence, something dynamic is at work within you, and you experience it, and you project it. A student of truth quite often mouths affirmations as if he were throwing darts at a problem. He has a problem out here and he beats it over the head with a cosmic club. He throws affirmation and barbs and arrows constantly. "You're God's child, you're wonderful, you're in tune with the infinite." Bang, bang, bang, he's throwing these things out. Watch an archer. He doesn't try to fling his arrows at the target. He stands at the line and he fixes the arrow to his bow, and he draws the bow back, building up an energy force, and then he doesn't push the arrow back, he simply releases it, and the arrow goes straight and true. Not because of his will, "Not by might nor by power but by my spirit, says the Lord of hosts." The affirmation, you see, is not something that you express with power. I've heard teachers often say, "Speak the word with power so that God will heal." Well, God's not deaf, and God, infinite-minded, knows you better than you know yourself. And his is the very word that you're speaking, is the power that you're using. So you're kidding yourself. The important thing is, be still and listen, and articulate the word, even if it's a word that you've taken out of the book. That's all right. But speak it, not as if the word is going to do some great thing, but that you're in tune with the power that does the great thing, and you simply whisper the word, and you let it go, and the word goes forth. But suddenly again, as Jesus would say, "The word is not my word, but the word of him who sends me." Now this is so very important, it's something that we kind of need to work on in consciousness to get ahold of. Now when I used the word, silence, I'm referring to what is often called meditation. I prefer the term silence because it is still unspoiled. Meditation, as a word, has been so contaminated with all kinds of notions and philosophies and techniques, as to almost lose its real validity. Today there are dozens of exotic techniques available to one who wants to meditate. This style, that style, sometimes depending on how much you want to pay to get the course, but it's involved in this technique or that technique and you sit and you do this and you go through certain positions and you learn to reflect upon your neighbor and all these things which are so much a part of eastern techniques. But the emphasis is normally on the how, and often as a debate about the correct procedure. I always like to quote the great yoga master Aurobindo who says, "It's not necessary to tell anyone how to meditate. If he is sincere enough, and open enough, he will find a way." So the technique can be a distraction, you see. Quite often, meditation that is entered into in a technical sense, using the correct procedure, stops short of a spiritual process, and becomes a very helpful therapy for relaxation and overcoming stress, and this is fine, and who's going to fault this. But it does not become a part of the process of spiritual prayer. Because there may well be no centering of consciousness at the very center of your being. See, true meditation, or as I am terming it, the silence, is not going somewhere, it's not reaching something, it's not even reaching for something, it's giving up the very desire to reach. This requires a great change in consciousness, because most of us are doers. I want to get it done. I want to meditate, I want to use the right technique, and I want to get there. So there is a tendency to use the unconscious to try to reach up and up and up into the very levels of consciousness up here somewhere. When you finally get to the top, you sit there and say, "Hey, I already made it, didn't I? I had a mind-blowing experience." It might have blown your mind, but you haven't blown God's mind. You haven't gotten any closer to spiritual reality than you were in the beginning. Because God isn't up there on top of the mountain. God is the depth within you. Enter into the inner chamber, and close the door. So you're not reaching for something. The need is to give up the very desire to reach. The presence of God is not something to get into, or something that you can fall out of. The presence is present here and now. Any attempt to find or to reach the presence is to practice the absence of God. You want to practice the presence, not the absence. If you're talking to God, reaching for God, meditating to get into a higher consciousness up here somewhere, then you're practicing the absence of God. We need us to practice the presence of God. I like to make a distinction, for the purpose of practice, between meditation, or the silence if you prefer, and prayer. Meditation is concentration at the center, prayer is the concentration of thought from the center. Now get this quite clear. One is center yourself at the point within you, which is God expressing himself as you, not going anything, not trying to help anyone, to heal anyone, not projecting it, just knowing it. This is meditation, this is the silence. This is inner prayer. What we call prayer, the affirmation, the treatment, as a projection of this consciousness is something else. Very important and very real. In one case, we get centered, we know our oneness, we get the feeling of wholeness, allness at the center, just the peace, and get this feeling that Plotinus expresses when he says "The whole universe rushes, streams and pours into me from all sides while I just sit quiet." Just know this, that prayer, as we normally think of it, is the projection of this consciousness. So then, out of this awareness, I look upon the thing that I'm concerned about, not with my eyes opened, but I look, I center my attention upon it, and I see the light of this inner power flowing forth. I don't make it go forth, but I see it going forth, just like turning a spotlight upon something, you see, coming out of that centered awareness. But the important thing is, that always, always, we need to begin with this consciousness of inner centering. So I said, this is the missing link in most metaphysical prayer treatment because most of us think of prayer and treatment simply as a matter of knowing a lot of words. Always the very first step should be, "Be still and know that I am God." Forget about the problem for a moment. If you want to, if you want to have a prayer time, write on a piece of paper the concerns, the persons, the situations, the job relationship or the problem with your boss, difficulties in the office, write it down so that you'll be aware of it. You can write any affirmative thoughts that you'll want to use relative to that, if you care to, lay it aside, and with that totally out of your mind, just be still and enter into a consciousness of inner centering, as if you didn't have a care in the world. Now that's not easy, that takes practice. Just go down into the wall of inner consciousness, center yourself, get the feeling that the whole universe is already working through you, and remember, you don't have to pray to God, God is praying for you. So be still and listen. Just be relaxed, be reception. People say, "Well what do I do? What do I say?" Don't do or say anything. You see, true silence or prayer is not doing, it is not doing. It's not doing something, but it is not doing. Understand that? It's the exact opposite, and that's why it takes discipline. Just be still and let. Listen. Get the feeling that the whole universe is pouring into you tremendous power, love, substance, intelligences, pouring into you like the charge going into a battery while the battery just sits. The battery doesn't have consciousness so it doesn't resist. It doesn't say, "Hey, I've got to start these cars." It just accepts. So think of yourself as a battery, accepting, receiving, storing up as the infilling process of spirit flows into you as you center yourself at the point of consciousness. Don't think of drain, restrain, or emptiness. You think only of wholeness and fullness. How long? There's no time in spirit. Fifteen seconds, two minutes, 10 minutes, not too long, because our consciousness begins to stray. Actually a matter of a few minutes is about all you need. But always let that be the starting point of all kinds of prayer. Treatment, affirmation, anything, always take time to create the condition that makes the result inevitable, to get the light switch turned on, to remember that it is not my power but the power of spirit flowing through me. Make contact with the power. This is the archer, pulling back the arrow, building up the energy, so that when you get ready to speak the word of truth, affirm the truth, or whatever your prayer process may be, you won't have to fling the arrow, you simply release it. You don't have to dynamically project this affirmation or treatment, but you simply whisper it, you voice it, silently, quietly, that the power is that which flows through the affirmation, and uses it purely as a vehicle, as a conduit, and it goes forth to accomplish that work to where it is sent. Never pray until you've taken this time of oneness. This is the power, this inner awareness, and often just by letting go of the problem, and knowing oneness, the concern about the problem and the problem itself disappears into nothingness. In most cases when we really understand the spiritual process, we enter into silence, wordless silence, when we're still enough, as the Chinese say, "The heavenly heart reveals itself." When we're still enough, suddenly we feel a flooding within us of a light process, a transforming healing process, and we find ourselves thinking, "Amen. It's all over." Then you look around and you say, "I can't even remember what it was I was going to pray about." That's true answered prayer, because it's dissolved, it's done, it's over. Along the way, most of us are verbal creatures, and we may want to verbalize it through an affirmation. Okay, fine, but be very sure that your affirmation is not an attempt to make it happen, because then you're in human consciousness, you're in willfulness, you're in the ego, and you're also practicing separation. Just be still and know, oneness, wholeness. And let it happen. Now let's just take a moment to think about our homework assignment. I hope that some of you have been working on your homework assignments. Two parts today. First of all, the silence or mediation process, which is a centering process. Some of us have experimented, some of us have done very little of it. Remember, this has nothing to do with praying for something or praying to someone or praying about something. This is simply getting in tune. So take time to practice the idea of getting centered. Remember, it's not doing something, so you don't have to say, "How do I meditate?" As long as you're thinking of how to do, you're not going to do it. Because you're simply going to learn how to gargle. So it's not doing, it is not doing. Learn to be still. Be still, be still, be still, you're settling down into a well, and the deeper you go into the well, the less concerned you are with doing things, saying things, being something, articulating something, you just feel a sense of oneness and know that suddenly you feel that sense of universal supportiveness, and just rest in it quietly. If you want to use a visualization, use the image that we use on our logo, and that's the reason for the logo itself. Remember the logo shows the stick figure of a person? If you haven't paid any attention to this, look at the program when the lights come back on. On the front page, you'll see the logo. It shows a stick figure with the arrows coming from all sides. This is the universe rushing, pulling, streaming into me from all sides while I just sit quiet. It's not something you have to do. It's not reaching God. God knows you better than you know yourself. God is love in you and it's his longing to perfect himself in you. Just be still and let it happen. Practice that. The second part of it is, to involve yourself in a prayer treatment for something about which you're concerned. It may be your own personal problem, physical condition or relationship or something at the office or just generally the world peace situation itself. So now, after you have had this sense of centering, without trying to articulate some specific thing that's going to change people, because I often say, "Don't try to set things right, try to see them rightly." So out of this consciousness of oneness, without opening your eyes but then subconsciously, turn to that thing and look upon it, but remember the eye is a fountain that flows forth with light, so think of light streaming forth to that situation, bathing it in light, and that's the healing power coming out of you, through you, not what you're trying to change, but out of the change consciousness you are seeing it correctly, and in that seeing, there is a healing flow. Again, because you're a verbal creature you may have prepared yourself with an affirmation, so use the affirmation, the statement of truth, but speak it this time quietly, whisper it, don't say it over and over again because the moment you do you're into the thought of, "I've got to say it to make it true," and you can't make it true. If you've got to make it true, then it will never be true. You see, it is true. So you whisper that affirmation as a supportiveness, as a conduit through which the power flows, but the words are not your words but the words of him who sent me. Practice that in terms of praying for yourself, your condition, your job, your finances, or someone else, or the world in general. Two specific things. Practice the inner process of centering, and the outer process of projecting that centered consciousness. That will keep you busy for the next 20 years. Well we invite you to be back again next Sunday to report on it. Let's take a moment to be still. In this stillness I want to suggest, feel a sense of gratitude. That's all, just feel grateful. Feel grateful. If there's ever been a time in your life when you've had a tremendous sense of gratitude for something that's happened, you can probably remember that exhilarating feeling. Let your consciousness now express and experience that exhilaration. Just feel it, feel grateful. This is also to create the condition that makes the result inevitable. This is why we give thanks. We don't give thanks to God because God needs it, because God is an allness too great, too universal to require our thankfulness and gratitude and praise and appreciation. So we don't give thanks to God for his sake, but for ours, because the gratefulness gets us into a full-of-greatness consciousness, and as we feel grateful, we throw the switch, and we create the condition that makes the result of dynamic life and the flow of intelligence and love and peace and power come through us and manifest as us effectively. And may you nod at this consciousness of gratitude, of thankfulness and praise, experience that infinite flow. May it feel so good that in the days to come you will practice this many times over and experience this same flow as you throw the switch in a feeling of gratitude. Praise God for the truth that makes us free. Amen.